So the reveal of Geek Inked Magazine's April cover shoot was today... I am so floored. I'm not going to ramble on and on with this one since it's pretty self-explanatory ^_^. Set of photos and a little bit of an interview are on the site (just click on the image above). I wasn't actually supposed to be their cover girl for this month, but had the fortune of being in the right place at the right time. As a bonus, I found a video from the con which has a little bit of behind-the-scenes of my shoot, as well as a snippet of my time on stage being introduced as a masquerade judge. Above you will find a little introduction to Con-G, and my participation in the convention this year. As I mentioned in the video, the Greyhound bus which my friends and I took to Guelph ran late, which means that Friday became much more of a rush than I had wanted. By the time Dan (The Video Ninja) and I had checked into our hotel room, I barely had time to unpack my supplies for my mask workshop, unpack the decorations for my birthday party, and throw on my costume before I had to run out and find my panel! Luckily I have awesome friends, so Featherweight picked up my badge for me while I was running around in a panic and Dan set up the decorations I didn't have time for while I was teaching my workshop. The workshop itself went well, I think! There were a few hiccups of course, like taking a little while to set-up all the materials and equipment, no tables for people to work on their masks, and ironing boards with legs that would't lock, but we managed. Having learned a lot from doing previous mask-workshops, I started with a demo and provided templates for everyone to use for their own designs. Featherweight was a fantastic help by monitoring irons and keeping people on track for which step came next. Unfortunately, since we had people dropping in throughout the 2-hour block and I didn't actually count how many pieces of foam and Steam-a-Seam I had pre-cut I don't know how many people ended up making a mask, but we're guessing 15-25. I wish I'd gotten photos of everyone's work, but I was too busy keeping things running to take pictures before people left. Featherweight did record the demo portion of the workshop panel though, so that might go up as a video later this year. Lucky for me, my bff Kia delivered some sweet potato fries at the end of the workshop so I could eat something before running back upstairs to host my birthday party. The party was pretty great, lots of my friends who were at the con stopped by and I'm so happy to have seen all of you. I'll make a post later on about all the decorations I put up, but for now I'll just post a video that Dan put together with birthday footage. Debs & Errol are a geeky-musical duo, but they also produce a daily webcomic which is up on their website. The last week or so the comics have been about their experience as special guests at Con-G including one about my party, which features me! It's my webcomic debut! ^_^ And (unfortunately), like most of the Debs and Errol comics, the events contained within actually happened. Saturday brought on another full day of panels! One thing that I liked about Con-G this year was the flexibility of panels (at least in terms of the cosplay track; I can't speak for the rest). Because it's a (relatively) small convention and almost all of the guests and panelists have been cosplaying and attending conventions together for years, we know each other's strengths and we help each other out whenever there seems to be a need. Sometimes it's pre-planned (like Featherweight being my assistant for the mask workshop, and I being his assistant for his puppet demo) but sometimes it's not. When it appeared that I was going to be the only panelist for "Masquerade 101", my friend and all-around awesome cosplayer Brian volunteered to join me, and Jo (the panel coordinator) managed to snag Mark of ConBravo! to share his advice as well. While I could have handled Masquerade 101 on my own, it's always better to have more than one perspective, so I'm quite grateful to the guys for jumping in with no notice. And I got to pay the favor forward immediately afterwards by sitting on the Props Q&A panel with Featherweight, just being back-up, since Kudrel was running a few minutes behind. Right after props was GillyKins's spandex panel which I attended, after which I got an hour's break (trading Olivia of Olivia's Atelier the use of my glue gun in exchange for pizza XD) before cutting felt with Featherweight for his puppet demo. 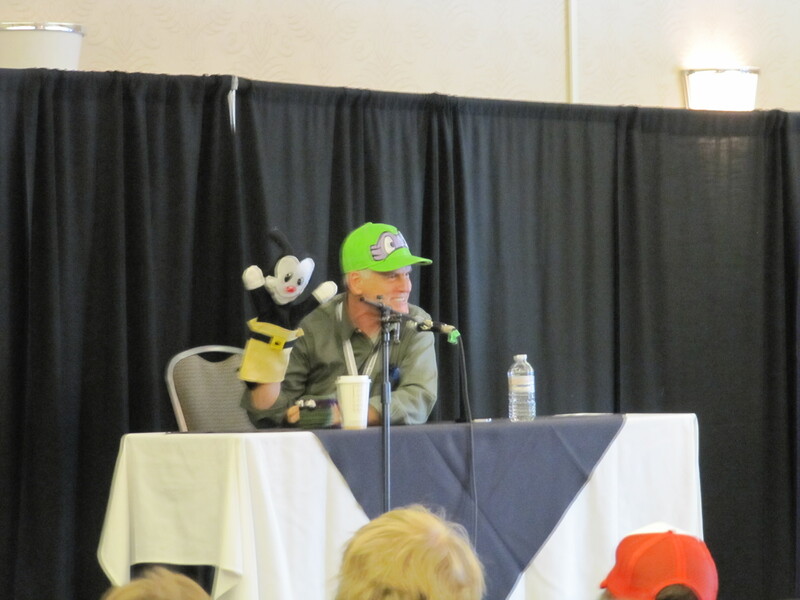 This year's puppet was Yakko from Animaniacs, which we got done in time, and was presented to Rob Paulsen on Sunday - he loved it! (photo snagged by Fazeman). Had a very slow dinner (what's with the service at hotel restaurants during cons??) with good company including Dan, Jackie, Elemental, The Letter Jay, and Trish before heading to the main room to watch the masquerade. Which was great, and you can watch right here. The last panel of the night was shortly after the masquerade ended, so I had just enough time to grab my hoodies from my room before meeting up with Brian and doing my "Hats Hoodies and Kigus" panel. I think it went well, but I was also pretty tired by that point. We had about the attendance I would have expected for that time slot. People asked lots of questions and we had lots of examples to share, and I sketched out one hat and one kigu design by request. I pretty much hermited in my hotel room for the rest of the night, not having the energy left to deal with energetic dancing people or drinking party people. Several people came to visit me though, which was really nice. I don't have a photo gallery from the con this year (aside from the mask workshop, my camera never even left my hotel room), and the inexcusable delay on this report is partially due to coming down with a bad case of con-plague (as per usual). But to wrap up, I will share Dan's guest interview video, wherein I and the other guests talk about the Con-G experience, and there's a lot of general convention coverage. And to finish summing-up, I have updated my galleries with photos from G-Anime and Con-G! There are new photos for Fluttershy, Alice, Wendy, and Crystal Entropy. My plan to start 2013 off on the right foot by posting more blog and updating more regularly is not going as well as I planned since it's already February, but hey, you gotta start somewhere. First off, appearances around the web! I wore my Goth Kim Pine costume on Sunday of NYCC this year, and Comics Alliance snapped my photo in the hall - which I was rather surprised to spot on one of their "Best Cosplay Ever" posts from the weekend! I have friends who are featured on Comcs Alliance for their cosplay relatively regularly (one of whom, Gilly-kins, is in the same post as Donna Troy) but since I rarely do comics costumes, it's a special treat to have been featured! Click the thumbnail to see it full-size. Hanie Mohd, who drew/designed the "DC girls in sweaters" artwork that I based this outfit on, recently reblogged the photos of my Catwoman costume again! Awesome ^_^. Unlike many of my friends, I never get the attention of the source-material creators with my costumes, so it's extra special to have her acknowledge and like my interpretation. Click the thumbnail to see the post. My OC from the Dr Holocaust universe, Crystal Entropy, was included in artwork by Daria-rat on DeviantArt, along with other local and internet-based "villain" characters. I am so flattered that she included the character, especially since Crystal is almost unknown relative to the other characters involved with the Doc's story/videos/appearances. Click the thumbnail to see it full-size.